Master this training technique to add more size and strength to your wheels. There is a term in athletics that can be applied to successful training for any sport. This term is “transfer of training.” When designing programs, transfer of training should be the main factor in determining what exercises should be executed. Transfer of training, very basically, refers to the amount of transfer an exercise has to the competition movement. Using an example from my own athletic background, throwing heavy shot puts has a very high transfer rate to throwing the competition weight shot put; while preacher curls have a very low (if not non-existent) transfer rate to throwing the shot put. The idea of transfer of training can easily be applied to the iron game. If your goal is to get a huge squat… then get the bar on your back and SQUAT! One species of the iron kingdom has been using this concept of transfer of training correctly for years, of course I am talking about Olympic lifters. Almost every exercise they do is a variation of their competition lifts. When is the last time you saw an Olympic lifter doing calf raises? I am betting never! When choosing exercises to add to your program the highest priority should be placed on the exercises that most closely mimic the competition lifts you want to improve, whether that be deadlift, squat, bench, or the Olympic lifts. Squat day is the one that a lot lifters don’t get right. Too often you see the wannabe powerlifter hit some sets of squats and then head over to the leg curl and leg extension machines. While these might be a good idea for the “all show no go,” barb wire tattooed, beach-body types, it is a complete waste of time for the athlete seeking to add plates to the bar. Instead of doing these exercises, why not vary your stance to hit different muscle groups? By varying your stance you can still work different muscle groups while mimicking the squat… the lift you are trying to improve! Don’t get me wrong, not all exercises on squat should be a squat variation… but the bulk of your workload should. Exercises like the RDL, glute ham raise, and reverse hypers are great posterior chain movements and definitely have a place in a serious squat program. Do your normal working sets of squats. Follow this by doing 3 sets of 6 reps of narrow, or “bodybuilder” squats. These will give you the quad work you need while still performing a lift that is very similar (and therefore has a high rate of transfer) to the squat. Next, perform 3 sets of 6 repetitions of front squats, another quad dominant exercise. After your front squats, do 3 sets of 5 repetitions of wide squats. Wide stance squats focus more on the adductors, hips, and glutes. After you finish your wide stance squats, you are going to do 3 sets of 5 reps of Kang squats, a posterior chain movement. To perform the Kang squat put your feet about shoulder width apart and do a good morning, then drop down into a full squat, reverse the movement by shooting your hips up and getting back into a good morning positions, then finish by doing the up part of the good morning. After you have finished all these squat variations, do 3 sets of 10 reps of glute ham raises. 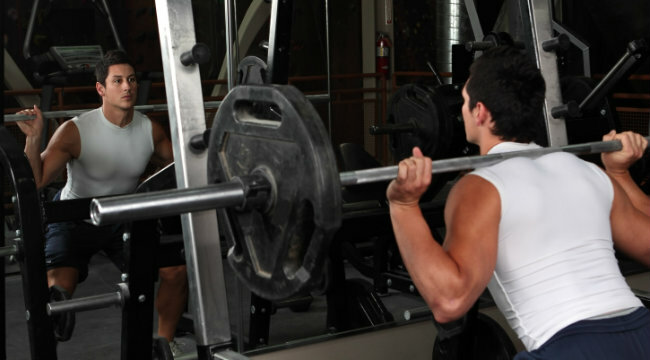 If you have hit a plateau in your squat, it’s time to change up your routine. When designing your new program make sure that all of the exercises have a high rate of transfer to the squat. We have a finite amount of time and energy… don’t go wasting them on useless movements!